One of the more interesting start-ups to be found among the health and wearables section of CES 2018 was Black Box VR. The company – from the team behind Bodybuilding.com – is merging VR and fitness, to create an interactive strength exercise programme that's designed to get you working out while you play VR games. The product itself comes in two parts. The first is the physical framework, which features cable weights in a rack, much like you'd expect to see in the resistance machine area of the gym. The second part is a HTC Vive headset – although the company plans to stay device agnostic – which you put on to play the games. We had a go and the experience was… interesting. You put on the headset and a pair of notified Vive Trackers, which sit on the arms. When you don the headset, you're able to see your own arms in the game – that helps you control the firing and to find the handles, which augment themselves inside the experience. You're then prompted to grab the handles of the resistance machine. As you perform an exercise (e.g. a chest press) you'll fire huge flaming rocks at oncoming monsters. Get through a certain amount of reps to win the game, but crucially, the system will increase the resistance to really give you a workout. 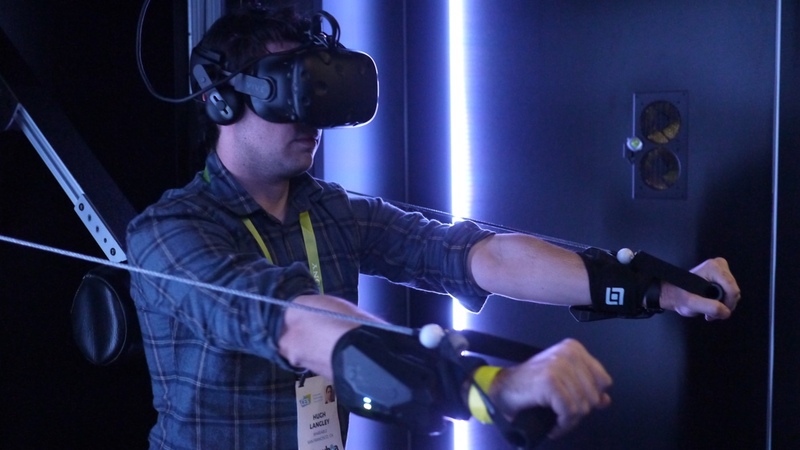 It certainly was an interesting demo – and Black Box VR says that playing games in VR while you workout reduces the perceived difficulty and helps people push weights for longer. The experience certainly worked pretty well, and we really liked the idea of the set-up controlling the resistance – stopping you from taking it too easy, but digitally finding the sweet spot to the perfect balance between muscle load and number of reps.
We managed about four levels of the game before we had to take a break – and to be honest, we were absolutely exhausted. As you'd expect it got pretty sweaty inside the headset, and while the games did guide you to improve your form (you had to hit the right spots to fire on the enemy) there will need to be a bump up in game quality and repeat playability for it to become a really compelling experience. We spoke to Black Box VR founder Preston Lewis, who said that Black Box VR had hired "some of the best minds in the game industry" which he said "would make it easy to scale" development in the future. But don't expect to see Black Box VR on sale any time soon. This proof of concept is the first stage, and then the company is looking to start its own boutique VR gym in the Bay Area to hype up its product. At that stage, we're told it will look to sell Black Box VR into gyms and make it available for home use.